Italian Serie A’s week ends in a somehow relieving way for the current league leader, Ac Milan, as they widen the gap with all of their direct title rivals, Inter Milan and Napoli, after those two teams suffered a surprising defeats this weekend. While Antonio Cassano celebrated his special day with a goal and assist for Milan against his former club, Sampdoria, Inter were taken down by relegation battler Parma and Napoli slumped into a 2-1 defeat against Champions League spot challenger, Udinese. 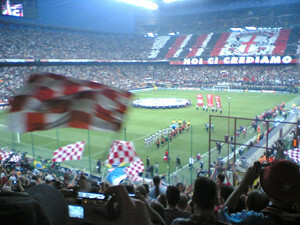 In San Siro, the Rossoneri fans’ first half concern over the injury of Christian Abbiati and Alexandre Pato was wiped away with Cassano’s brilliant contribution in the second period, as the ex Sampdoria man punished his former club with a spot kick goal and brilliant assist for Robinho. Having the news of Inter stumbling at the same time hinders Milan’s scarce of losing two important strikers, Ibrahimovic and Pato for next weekend since at least they have a pretty good gap that would make their Scudetto chances gets bigger. Inter’s exit from the Champions League seemed to effect Leonardo’s team in their weekend clash against Parma as instead of redeeming their poor performance against Schalke, the Nerazzurri sunk again after goals from Sebastian Giovinco and Carvalho Amauri brought three precious point for the home team. The defeat puts Beneamata’s chance in chasing their city rival gets slimmer considering their low motivation and current poor form. Making the week much more sweeter, on Sunday night, a depleted and out of form Udinese team pulled a shocking blow for Napoli’s title chance as Francesco Guidolin team surprisingly defeated the home team with goals from Gokhan Inler and German Dennis. The result came as a big surprise considering the fact that the Bianconeri were playing without Antonio Di Natale and Alexis Sanchez, while a pretty complete Napoli’s side were playing at San Paolo. Those results puts the Rossoneri six points clear of Napoli in second place and eight points from Inter with only five games remaining in the league, surely an advantage that must not be thrown away once again by Milan as mathematically they haven’t win the Scudetto as just yet. Moreover, with the potential of losing their important strikers in at least next weekend, the current gap surely give a slight of relief for Milan’s fans, although they surely hope that their team won’t waste this advantage anymore. Aside from affecting the title race, the results in week 33 also gives a potential spectacular race for the Champions League spot as there’s even a chance that next week Inter Milan might lose their third place position with Lazio starting to breath behind their neck. Picking up a convincing 4-1 victory against Catania, the Aquiloti are only three points away from the Nerazzurri and the two teams will be facing each others next week. A victory would make Edi Reja’s team climb pass the defending champion for an automatic qualification spot for next year’s UCL, simply because Lazio should have a head to head advantage over Inter. Moreover, with Udinese are only one point behind Lazio, the race for the Champions League spot will definitely gets more heated in the next five matches especially since teams like As Roma and Juventus haven’t actually giving up their shot in getting into Europe. Many speculation could even occurred in the next few days especially if Napoli have really given up in chasing Milan, considering the gap between the top clubs isn’t that big only consistent results would secure their place in the table.